Dr Mat Francois a molecular geneticist specialised in transcription factor biology in embryonic development and inflammation. Mat's PhD (awarded in 2004) focused on the role of nuclear receptors PPARs in the control of the inflammatory reaction during osteoarthritis. In 2005, he moved to IMB's Koopman Group to study the role of SOX transcription factor in the control of lymphatic vessel development. Mat launched his independent research career based on the discovery of the role of the transcription factor SOX18 as a molecular switch to induce the embryonic development of the lymphatic vessels. Following up on that finding, he's been awarded with the ASMR Queensland Premier’s award in 2009 and a UQ Foundation Research Excellence Award in 2011. 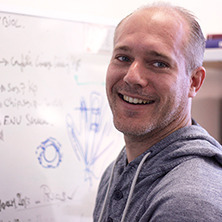 In September 2011, Mat set up his lab to focus on the initial step of endothelial cell specification and the molecular hierarchy that governs this differentiation program during embryogenesis. Recently he received a CDA (Career Development Award) to elucidate the role of SOX protein in the modulation of the lymphatic and blood vascular growth that control tumour metastasis. Mat's strategic approach to research is now based on the combination of developmental biology and the use of pathophysiological models (e.g. cancer metastasis and lymphoedema) in combination with a drug discovery pipeline to identify novel therapeutic approaches to block cancer metastasis and manipulate transcription factor activity. Lymphatic vessels are a vital component of the vascular system and are essential for immune surveillance and maintaining fluid balance. In the adult, aberrant formation of lymphatic vessels is associated with a wide range of diseases that include chronic inflammatory disorders, such as rheumatoid arthritis, cancer metastasis and lymphoedema. Under these pathological conditions, the developmental programs that drive lymphangiogenesis become dysregulated. Therefore, understanding the molecular basis that governs normal lymphatic vessel development in the embryo is a prerequisite to further identify novel target genes and develop potential new therapeutic avenues to prevent aberrant development in adults. Our research identifies and characterises key genetic pathways influencing lymphatic vascular development in the mouse embryo. We are using pre-clinical mouse models of cancer or lymphoedema to validate the central role of developmental programs that are reactivated in these diseases. This work will help us to develop a new class of compounds that will enable the pharmacological management of the lymphatic network, with the view to explore vascular development and establish the basis for drug development. The experimental strategies we have pioneered to perform this translational research program rely on a range of tests and involve close collaborations with other IMB scientists and international research groups with expertise in zebrafish and mouse genetics, medicinal chemistry biophysics and genomics. Lymphatic vessels are a vital component of the vascular system and are essential for immune surveillance and maintaining fluid balance. In the adult, aberrant formation of lymphatic vessels is associated with a wide range of diseases that include chronic inflammatory disorders, cancer metastasis and lymphoedema. The vasculature is also centrally important in cardiovascular diseases and cancer progression. We aim to better understand how the vasculature forms during development and to translate our findings into a deeper understanding of disease. We study several aspects of vascular development and biology. Richette, Pascal, François, Mathias, Vicaut, Eric, Fitting, Catherine, Bardin, Thomas, Corvol, Maїté, Savouret, Jean-François and Rannou, François (2008) A high interleukin 1 receptor antagonist/IL-1beta ratio occurs naturally in knee osteoarthritis. Journal of Rheumatology, 35 8: 1650-1654. Bower, Neil, Kartopawiro, Joelle, Le Guen, Ludovic, Karnezis, Tara, Achen, Marc, Stacker, Steven, Francois, Matt and Hogan, Benjamin (2014). IQGAP2 is a novel mediator of Vegf-signaling during zebrafish lymphangiogenesis and angiogenesis. In: Angiogenesis. , , (977-978). .
Francois, Mathias, Hosking, Brett and Koopman, Peter (2009). Molecular and Cellular Events Regulating the Early Development of the Lymphatic Vasculature in Mice. In: Journal of Vascular Research. 14th Meeting of the Australian-and-New-Zealand-Microcirculation-Society, Queenstown New Zealand, (2-2). Aug 25-27, 2009. Assessment of the synovial fluid interleukin-1 receptor antagonist (IL-1Ra)/interleukin-1 beta (IL-1beta) ratio in patients with osteoarthritis and rheumatoid arthritis. Richette, Pascal, Francois, Mathias, Vicaut, Eric, Bardin, Thomas, Fitting, Catherine, Cavaillon, Jean-Marc, Savouret, Jean-Francois and Rannou, Francois (2006). Assessment of the synovial fluid interleukin-1 receptor antagonist (IL-1Ra)/interleukin-1 beta (IL-1beta) ratio in patients with osteoarthritis and rheumatoid arthritis.. In: Arthritis and Rheumatism. 70th Annual Scientific Meeting of the American-College-of-Rheumatology/41st Annual Scientific Meeting of the Association-of-Rheumatology-Health-Professionals, Washington Dc, (S575-S575). Nov 10-15, 2006. Pharmacological induction of heme oxygenase-1 decreases the acute phase of inflammatory arthritis in a mouse model of polyarthritis. Benallaoua, Mourad, Francois, Mathias, Batteux, Frederic, Shyy John, Y. -J., Fitting, Catherine, Tsagris, Lydia, Boczkowski, Jorge, Savouret, Jean-Francois, Corvol, Marie-Therese, Poiraudeau, Serge and Rannou, Francois P. (2006). Pharmacological induction of heme oxygenase-1 decreases the acute phase of inflammatory arthritis in a mouse model of polyarthritis.. In: Arthritis and Rheumatism. 70th Annual Scientific Meeting of the American-College-of-Rheumatology/41st Annual Scientific Meeting of the Association-of-Rheumatology-Health-Professionals, Washington Dc, (S638-S638). Nov 10-15, 2006. Richette, P., Francois, M., Bardin, T., Bazille, C., Fitting, C., Cavaillon, J., Corvol, M. and Rannou, F. (2006). High synovial fluid interleukin-1 receptor antagonist (IL-1 RA)/interleukin-1 beta (IL-1beta) ratio naturally occurs in human knee osteoarthritis. In: Annals of the Rheumatic Diseases. Annual European Congress of Rheumatology (EULAR 2006), Amsterdam Netherlands, (122-122). Jun 21-24, 2006. Benallaoua, Mourad, Richette, Pascal, Francois, Mathias, Tsagris, Lydia, Revel, Michel, Corvol, Maité, Poiraudeau, Serge, Savouret, Jean-François and Rannou, François (2006). Modulation of proteoglycan production by cyclic tensile stretch in intervertebral disc cells through a post-translational mechanism. In: Selected papers of the 4th International Symposium on Mechanobiology of Cartilage and Chondrocyte. 4th International Symposium on Mechanobiology of Cartilage and Chondrocyte, Budapest, Hungary, (303-310). 20–22 May 2006. Richette, P, Francois, M, Fitting, C, Rannou, F, Tsagris, L and Corvol, MT (2004). A PPARalpha-dependent pathway increases IL-1ra production and protects from IL-1beta detrimental effects in articular chondrocytes. In: Arthritis and Rheumatism. 68th Annual Scientific Meeting of the American-College-of-Rheumatology/39th Annual Scientific Meeting of the Association-of-Rheumatology-Health-Professionals, San Antonio Tx, (S278-S278). Oct 16-21, 2004. Rannou, FP, Liu, Y, Francois, M, Benallaoua, M, Richette, P, Poiraudeau, S, Shyy, JY and Lee, TSY (2004). Induction of heme oxygenase-1 inhibits interleukin-1 beta-dependant nitrite oxide production in articular chondrocytes. In: 68th Annual Scientific Meeting of the American-College-of-Rheumatology/39th Annual Scientific Meeting of the Association-of-Rheumatology-Health-Professionals, San Antonio Tx, (S284-S284). Oct 16-21, 2004. Moulin, D, Bianchi, A, Boyaul, SD, Morin, S, Koufany, M, Francois, M, Netter, P, Terlain, B and Jouzeau, JY (2004). Modulation of interleukin-1 receptor antagonist by peroxisome proliferator-activated receptor gamma agonists in rat synoviocytes is PPARgamma-independent. In: Arthritis and Rheumatism. 68th Annual Scientific Meeting of the American-College-of-Rheumatology/39th Annual Scientific Meeting of the Association-of-Rheumatology-Health-Professionals, San Antonio Tx, (S326-S326). Oct 16-21, 2004. Rannou, FP, Liu, Y, Benallaoua, M, Francois, M, Richette, P, Poiraudeau, S, Shyy, JY and Lee, TS (2004). Induction of heme oxygenase-1 inhibits interleukin-1 beta-dependant nitrite oxide production in articular chondrocytes. In: Osteoarthritis and Cartilage. 9th World Congress of the Osteoarthritis-Research-Society-International, Chicago Il, (S6-S6). Dec 02-05, 2004. Richette, P, Dumontier, MF, Francois, M, Tsagris, L, Korwin-Zmijowska, C, Rannou, F and Corvoi, MT (2003). Dual effects of 17 beta-estradiol on IL-1 beta-induced proteoglycan degradation in chondrocytes. In: Annual European Congress of Rheumatology, Lisbon Portugal, (127-127). Jun 18, 2003. Dose-responsive effects of estrogens on interleukin-1 beta induced metalloprotease gene expression and no production by articular chondrocytes. Richette, P, Tsagris, L, Korwin-Zmijowska, C, Francois, M, Dumontier, MF, Laborde, K and Corvol, MT (2000). Dose-responsive effects of estrogens on interleukin-1 beta induced metalloprotease gene expression and no production by articular chondrocytes.. In: Arthritis and Rheumatism. Annual European Congress of Rheumatology, Lisbon Portugal, (2862-2862). Jun 18, 2003. Deciphering the transcriptional program that instructs lymphatic endothelial cell fate. Small molecules discovery to inhibit outgrowth of lymphatic vessels: A novel strategy to probe lymphangiogenesis.